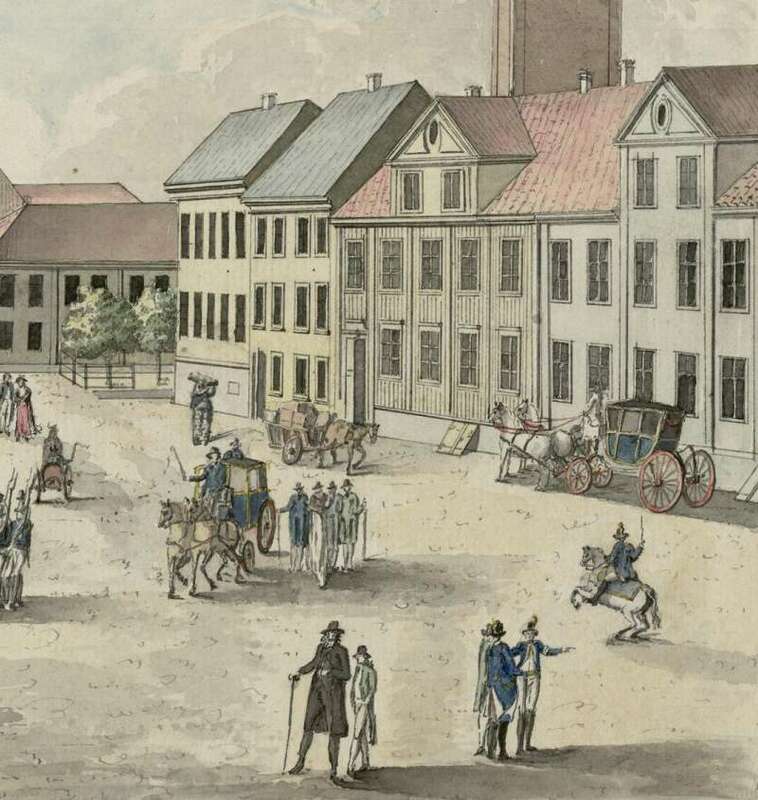 Excerpt from TRAVELS IN SWEDEN DURING THE AUTUMN OF 1812 BY THOMAS THOMSON, LONDON 1813, Pages 5, 6-8, 8-9, 11-14. "When we went aboard our own vessel on Monday after breakfast we were at Winga Beacon which stands at the mouth of the small bay upon which Gottenburg is built. Few objects are more striking or dreary than the Swedish coast when approached in this direction. The bay is full of islands consisting, without exception, of the most naked and steril rocks I had ever seen. These rocks vary in height from a few feet above the level of the sea to nearly 300 feet. They are generally long ridges, precipitous on one side, and sloping more gently on the other. Not a single plant, not even a lichen or moss is to be seen upon them. So that they appear utterly unfit to contribute to the support of man. Yet here and there we saw small wooden cottages appearing under the shelter of these rocks; inhabited no doubt by fishermen and pilots one of whom came aboard our ship." 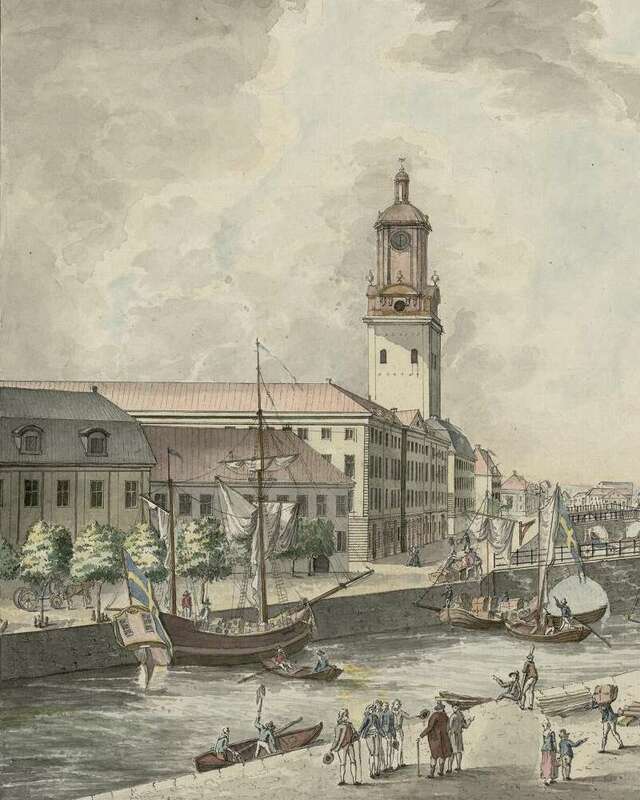 "I was struck with the great number of vessels lying in the harbour of Gottenburg. A fleet of 3oo sail had left it a few days before and the number still remaining could not be fewer. As we approached the town, we passed by a small fort called New Elfsborg, situated upon a rocky island and intended to prevent the advance of hostile vessels. It has a garrison of 250 men. Our vessel anchored at Mastuget, a village about a mile south from Gottenburg, and a kind of suburb. We were going ashore without any formality, when we were told by our Captain, that the laws of Sweden did not permit any passenger to land till the vessel had been visited by the custom house officers: non compliance with this condition we were told, was punished by a fine of 300 rix dollars. In consequence of this information, we thought ourselves obliged to remain aboard the vessel. The custom-house officers at last made their appearance at four o'clock and after a slight inspection of our portmanteaus, and receiving a little money, we were permitted to go ashore. We found afterwards that there was no necessity for staying aboard as we did; that deviations from the strict letter of the law were common, and that with regard to foreigners it was usually winked at or easily made up by a little address. We prevailed upon the Captain to row us up to town in the ship's boat. There is a canal which runs through the middle of the principal street in Gottenburg. When we came to the extremity of this canal, opposite to the Governor's house, where the town began, a customhouse officer perceived us and our boat. He hauled out lustily and made signs to us in a threatening manner, to bring our boat to the margin of the canal. His whole manner indicated a confident expectation of a lucrative prize. When we opened our portmanteaus, in consequence of his orders, and when he saw that they contained no contraband goods of any kind, but merely a few books and clothes, he slunk away very much disconcerted, and allowed us to proceed. When the boat had rowed as far as the middle of the street, we went ashore to look for an inn. Our surprise was not small and our disappointment extreme, when we traversed the whole city from one end to the other without meeting with any house that had the least appearance of an inn or a hotel. As we were unacquainted with the language, and therefore had no means of making inquiry, we were utterly at a loss what to do. Luckily we met our Captain, who carried us to his broker, a gentleman who understood English: by him we were informed that Gotten burg contained no inns, but that there were two hotels at the east end of the main street, where we might perhaps find lodging and breakfast, but that they would not provide us with dinner. He told us likewise that the concourse of strangers at Gottenburg was always so great that these two houses were usually overflowing with lodgers. He immediately carried us to what he called the best of these houses, and we found to our mortification that they had not a single empty room. In the other however, kept by a Swede of the name of Blum, we got a couple of rooms, and began to feel ourselves pretty comfortable after the fatigues of our voyage. This total want of inns in a place like Gottenburg, which is at present a great thoroughfare, being the channel of communication of Great Britain and the continent, is quite unaccountable. There are indeed at Mastuget two houses kept by natives of Great Britain, a Mr. Tod and a Mrs. Ribbens, which are the great rendezvouz of the captains of British merchantmen. But they are little better than ale-houses and so crowded that you might as well attempt to lodge in the middle of Bartholomew fair. If any Englishman properly qualified for the purpose were to set up a good inn at Gottenburg, he would be certain of making a fortune in a few years." "Gottenburg is entitled to the name of a magnificent city. It consists of a long wide street called Stora Hamna Gatan (Great Harbour street). The houses on each side of this street are three stories high, built of stone or brick, and covered with white plaster. The windows are large, and all of them are folding windows after the French fashion. No sashes are to be seen in Sweden. The roofs are mostly flat and concealed. The houses are all large, and some of them are decorated with pillars. Along the middle of this street runs a canal, which is crossed at certain places by wooden bridges. There are two of these bridges which are built for the convenience of carriages, and are decorated with wooden figures of lions and men in armour. The other bridges are only for foot passengers. This principal street is crossed at right angles by three or four other streets, through some of which the canal also runs. The principal of these are distinguished by the names of Nord Hamna Gatan, and Soedra Hamna Gatan (North Harbour street and South Harbour street). Parallel to Stora Hamna Gatan, both on the north and south, there run other streets which are much narrower and not nearly so magnificent. Towards the west end of the town there is a hill about loo feet in height, up which some streets run. On the east side there is a marsh which must be very disagreeable in summer, though it may have its conveniences in winter. The streets are all paved with round stones; but there is no foot path for passengers either in Gottenburg or in any other town in Sweden. Indeed the scarcity of flag-stones in that country is a sufficient apology for this omission. In a church at present building in Gottenburg, and which will be a very magnificent one, the stones for the pillars and other ornamental parts and indeed for the whole front, have been brought from Scotland at a very considerable expense. Gottenburg having been twice burnt down within these ten years, a law has been passed prohibiting the building of any more wooden houses. This law has contributed considerably to the embellishment of the city." The principal merchants in Gothenburg are Scotsmen. In consequence of letters of introduction which we carried to several of them, we experienced from that liberal and respectable body a profusion of kindness and politeness which it was impossible to surpass, and which it would be very difficult to equal. 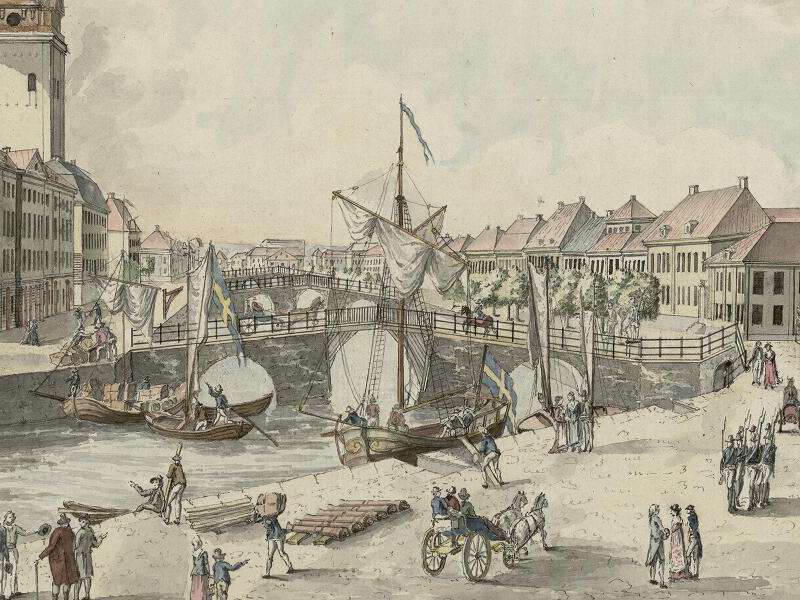 The want of inns, and our ignorance of the Swedish language, would have made it very difficult for us to have procured dinner while we stayed at Gothenburg, but this difficulty was obviated by the merchants, with one or other of whom we dined every day during our stay in that city. The entertainments which they gave were in the Swedish style, and possessed a degree of splendor at which I was not a little surprised. As the mode of dining in Sweden is very different from the mode followed in Great Britain, I shall give a general description of a dinner, that my readers may form some notion to themselves of the customs of that country. The houses in Sweden are fitted up with great magnificence. The public rooms are usually on the first floor, and vary from three to seven or more according to the size of the house and the wealth of its master. These rooms always open into each other, and constitute a very elegant suite of apartments. The furniture though very handsome is not similar to ours. You seldom see mahogany chairs; they are usually of birch or of some other wood painted. As the table cloth is never removed they have no occasion for our fine mahogany tables, and as the dishes are brought in one by one, and the dessert and wine put upon the table before the company sit down, they have but little occasion for a side-board. Accordingly, except in the house of Mr. Lorent, who had a very splendid side-board made in London, I do not recollect to have seen one in Sweden, even in the houses of men of the first rank. The rooms are not provided with bells. This I am told is owing to the extreme cheapness of servants in Sweden, which enabled every person to keep such a number as rendered bells unnecessary. This reason, which I do not consider as a very good one, exists not at present, for since the loss of Finland the wages of servants have considerably increased. Bells, therefore, might now be introduced with the greatest propriety; and to a foreigner, from Britain at least, they would constitute a great convenience. I have sometimes been obliged to go three times to the kitchen during the course of my breakfast, to ask for things that had been neglected or forgotten by the servants. The Swedes are fond of great parties. I have more than once sat down to table with nearly 50 people in a private house. The hour of dinner is two o'clock. After the company are assembled they are shown into a room adjoining the dining-room. In the middle of this room there is a round table covered with a table-cloth, upon which are placed bread, cheese, butter and corn-brandy. Every person eats a morsel of bread and cheese and butter, and drinks a dram of brandy, by way of exciting the appetite for dinner. There are usually two kinds of bread; namely, wheat-bread baked into a kind of small rolls, for I never saw any loaves in Sweden: and rye, which is usually baked in thin cakes, and is known in Sweden by the name of nickebroed. It is very palatable but requires good teeth to chew it. After this whet, the company are shown into the dining-room, and take their seats round the table. The first dish brought in is salmagundy, salt fish, a mixture of salmon and rice, sausages, or some such strong seasoned article, to give an additional whet to the appetite. It is handed round the table, and every person helps himself in succession to as much of it as he chooses. The next dish is commonly roasted or stewed mutton, with bacon ham. These articles are carved by some individual at table, most commonly the master of the house, and the carved pieces being heaped upon a plate are carried round the company like the first dish. The Swedes like the French eat of every thing that is presented at table. The third dish is usually soup, then fowls, then fish (generally salmon, pike or streamlings), then pudding, then the dessert, which consists of a great profusion of sweet-meats, in the preparation of which the inhabitants of Gottenburg excel. Each of these dishes handed about in succession. The vegetables, consisting of potatoes, carrots, turnips, cauliflowers, greens, &c. are handed about in the same way. During the whole time of dinner a great deal of wine is drunk by the company. The wines are claret, port, sherry, and madeira. What they call claret at Gottenburg does not seem to be Bourdeaux wine. It is a French wine with a taste intermediate between claret and port. At Stockholm I drank occasionally true claret; but scarcely in any other part of Sweden. As all the wine used in Sweden is imported from Great Britain, our wine merchants can probably explain this circumstance though I cannot. The Swedes employ the same articles for seasoning their food as we do, salt, pepper, mustard, vinegar, &c. I was struck with one peculiarity which I had never seen before: they always mix together mustard and sugar: I had the curiosity to try this mixture, and found it not bad. The dinner usually lasts about two hours. On a signal given the company all rise together, bow with much solemnity towards the table, or rather towards each other, and then adjourn into the drawing-room. Here a cup of coffee is served up immediately to every individual. It is but doing the Swedes justice to say that their coffee is excellent, greatly preferable to what is usually drunk in England. This is the more remarkable because the Swedes import all their coffee from Britain: its quality therefore is not different from that of our own, and its superiority owing solely to their understanding better how to make it. You can get coffee in the meanest peasant's house, and it is always excellent. It is usually about five o'clock when coffee is over. The company separate at this time, either going home to their own houses, or sauntering about in the fields if the weather be good. They collect again in the drawing room about half past six to drink tea. Swedish tea is just as bad as their coffee is good. If an epicure could transport himself in a moment from one place to another, he would always drink his coffee in Sweden, and his tea in England. The Swedish tea is so weak, that happening one evening to sit by the lady who was pouring it out, it struck me that she had accidentally forgot to put in any tea, and was pouring out nothing but hot water: I took the liberty to notice this mistake, in order as I thought to prevent the lady, when the tea should be handed round, from being put out of countenance by the detection of the oversight. My blunder occasioned much mirth, and the company no doubt set me down as a person very little acquainted with tea. It is not the quality of the tea that is bad, but the quantity employed is so small that you do not perceive the taste of it in the water. So that in fact you are drinking in reality hot water, sugar, and cream. The Swedish cream to do them justice, is excellent. Though I have met with some Englishmen accustomed to the London cream complain of it as too thick. After tea the company usually sit down to cards: supper is served up about nine, and the party separate for the evening between eleven and twelve. In some houses the interval between tea and supper was filled up by music. The Swedish instrument is a kind of harpsicord, not equal in its tones to our pianoforte. The music played is always Italian, and some of the ladies usually accompany the instrument with their voice. I could not find out that the Swedes had any peculiar music of their own; at least I could not succeed in Stockholm in procuring any specimens of it. All the music exposed for sale was Italian."